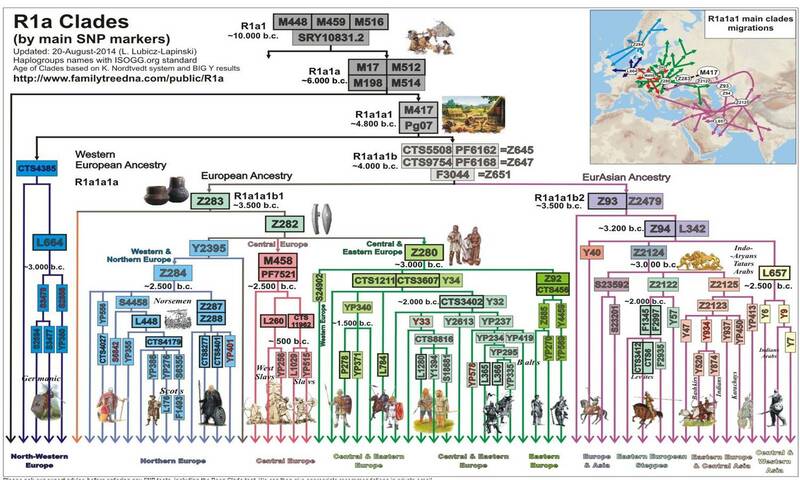 R1a was thought to be dominant haplogroup among the northern and eastern Proto-Indo-European language speakers, which evolved into the Indo-Iranian, Thracian, Baltic and Slavic branches. Corded Ware culture in Germany (2600 BCE), from Tocharian mummies (2000 BCE) in Northwest China, Andronovo culture (1600 BC) in southern Russia and southern Siberia, and finally various Iron-age sites from Russia, Siberia, Mongolia and Central Asia. R1a1 is defined by SNP M17. In a UK or Scots context, the R1a-M17 found is usually the sub-group R1a-L176.1, associated with Norwegian Vikings (30% of modern Norway) and the Gall-Ghàidheil, particularly in it’s appearance in the Chiefs of MacDonald and their claimed descent from Somerled. However, Many Gall-Ghàidheil descendants are also of R1b haplogroup, often L165 and L21 subclades, and R1b still comprises 28% of the Y-DNA lines of modern Norway.